The Titford Canal walk starts in the subterranean depths below the M5 at Oldbury Locks Junction and finishes at the Titford Pools, constructed as a reservoir in 1773-4 and the highest point on the BCN at 511ft. First up are the six locks that were opened in 1837 to access local coal mines and restored in 1974, sometimes referred to as the Crow Flight. Thomas Clayton was based at the bottom of the locks from 1889 - 1966, their boats collected tar and creosote, gas works by-products, and carried them to the nearby Midland Tar Distillers. Fuel oil products from Stanlow were also taken up the locks to the Shell depot next to Langley Maltings until a pipeline was built in the mid-1950s. The landscape is still industrial, a tyre recycling plant to your left followed by large tanks selling red diesel, but perhaps an improvement to when it was adjacent to huge chemical works expelling fumes and effluent. Between locks 4 and 3 you cross the entry to the Crow Arm which once led to Albright & Wilson's phospherous works and other chemical plants that dominated the Oldbury landscape. Perhaps it's a grey day but you can't help noticing that the water resembles Castrol GTX in colour, and the area was once probably the most polluted on the system. 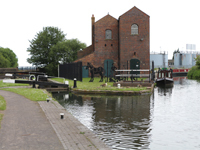 After the top lock and Engine House Bridge, you'll find the headquarters of the BCN Society at Titford Pump House, built originally to house a Boulton and Watt engine that pumped water back up the locks. The Coal Catchers railings and gate show a horse with women and children catching and collecting coal. There's also a crow reflecting the locks' alternative name. An explanatory panel might be worthwhile. The Tat Bank Branch or Titford Feeder leaves to the left, designed by Telford it has no tow path and leads to Edgbaston (Rotton Park) Reservoir and water reaches Smethwick Locks via the Engine Arm, see Gas St Basin to Bromford Jct walk. Going under the disused GWR Oldbury – Langley Green railway line, you get to the disused Langley Maltings, Grade II and derelict. Closed in 2006, and attacked by arsonists, it was saved from being bulldozed by English Heritage and the Victorian Society. More dereliction follows but generally the outlook improves as you make your way to the Navigation pub, and Jarvis Bridge carrying the Wolverhampton New Road which was a project to ease unemployment and opened by the future King Edward VIII in 1927. There's certainly a lot of wildlife activity in the form of ducks and geese as you approach the Portway Branch (1837) and the Causeway Green Branch. The Portway Branch continues under the colourfully decorated M5 following the edge of the reservoir before finally calling it a day at Birchfield Bridge. It was abandoned in 1954 having served coal mines in the Titford Valley. The Causeway Green branch bears left and passes an entrance to the pools where impressive views can be had of the motorway marching over the water. Opened in 1858, it was abandoned in 1960, and now comes to an abrupt end at the M5.